The teaching of music in schools goes back a long time. But the question is how effective can it be? The teachers are trained, but how much attention can a student learning an instrument get in a class with a number of others? What can school tuition offer that a private teacher can't? 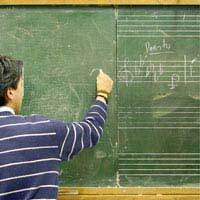 Perhaps the greatest advantage of school tuition is that it's free - no paying each week for music lessons. It's also a good, simple way for a child to discover whether he wants to learn a particular instrument, as well as receiving grounding in the basics of playing. Of course, in a perfect world, all children would receive some education in music, even if that didn't mean playing an instrument. But shifting educational priorities have given a focus elsewhere. However, every child who wants to should be able to learn an instrument. Even if they don't always appreciate it at the time, it's something that helps round them out personally - and they may come back to it later. The greatest disadvantage to being taught in a group is the lack of attention to each pupil; after all, the teacher has to spread his time equally among the pupils. So someone who's struggling a little might not receive the one-on-one tuition necessary and become discouraged early. The other factor is the limited number of instruments offered. If your child wants to learn something that's not offered, then you have no choice but to go private. It's a shame, but that's a necessity. Much of the learning relies on practice at home, which puts the onus on parents to make sure their children do the work they're supposed to. Of course, whether private lessons or school, you have to make sure they practice, but it becomes even more important here. School teaching can really never offer more than the basics of an instrument. If your child shows proficiency on the instrument, after a short while - say a year or less - you'll need to begin private lessons for them; it's the only way they'll improve properly. If your child shows an interest in one of the instruments being taught at school, by all means take advantage of the programme. But don't make more of it than it really is. Even the best teachers can only do so much in that situation. Violin is the most widely-taught instrument in schools, certainly at the primary level. You shouldn't expect miracles - most kids give up fairly quickly, especially if the teacher isn't very good (a situation that happens less often these days). Be sure to encourage and praise your child's efforts, and talking to the teacher just as you would a private teacher. All in all, although it's not perfect, school tuition can be a good first step to learning an instrument. The fact that your child is part of a group with others from the school can make them feel less isolated and nerdy about learning too. Remember, too, that if they show an interest in music beyond learning an instrument that it's possible to take music at secondary school. Don't be afraid to encourage that.